Take a close look at your final expense plans. Are they solid plans, or do you even have one at all? It is not too late to face reality and make preparations. Let’s look at the nuts and bolts of final expense life insurance. Final expense insurance is unique in the sense that most plans are very simple. Insurance companies primarily offer whole life policies that are backed by solid guarantees of level death benefits and level premiums for your whole life. Mostly these policies are what we in the industry call simplified or even guaranteed issue. This means very limited underwriting, no paramed or blood samples, and usually only about 10 health questions to answer. Final Expense plans usually have a level, graded, or modified death benefit, depending on the actual health and medications of the applicant. 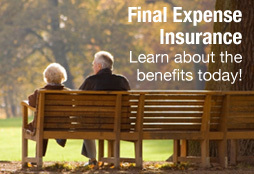 Contact me for a list of the top final expense plans available in your area, or for a free funeral planning guide. 1. Do you need a funeral trust? It’s simple to find out if you do. 2. Are you concerned about a possible Medicaid spend-down due to a long term care confinement? 3. Do you need an immediate death benefit, but cannot qualify for traditional coverage? 4. Are you over the age of 85 and cannot apply or qualify for life insurance? 5. Are you one who is not satisfied with a set benefit, but would like an increasing death benefit to better keep up with inflation? If you answered yes to any of the above, then you should consider a funeral trust through our partners at National Guardian Life. Setting up a funeral trust is simple, NO health questions, guaranteed approval, up to $15,000 immediate benefit, and ultimately peace of mind. A funeral trust stays outside of one’s estate, and therefore is safe from a mandated Medicaid spend-down, unlike a traditional life insurance policy, and will be there when your family needs it most to carry out your final wishes the way you would have wanted it. Call or email me, Phillip Kidd, with any questions concerning life insurance and final expense planning, or set an appointment at our brand new office in the Darien city limits across the street from the Library!